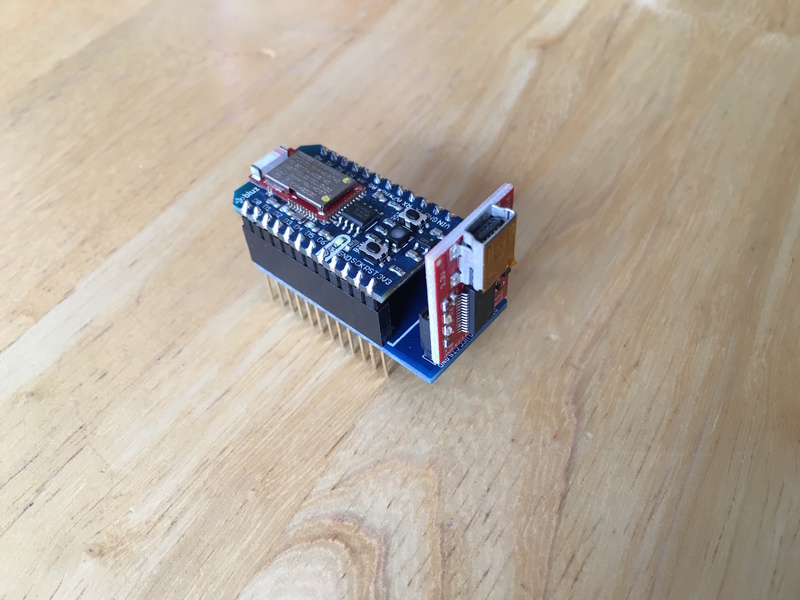 The UART shield connects bluz DK to the provided SparkFun FTDI Basic Breakout board for easy UART communication to a PC. The SparkFun FTDI Basic Breakout is a breakout for the FTDI FT232RL USB to serial IC. It runs at 3.3V and will power your bluz DK as well as provide a way to connect it to a PC for UART communication. This board can be used with many 3.3V compatible microcontroller platforms beyond bluz DK and is included with the purchase off the bluz UART shield. More details can be found on the SparkFun website. The UART shield is a simple breakout board for the TX/RX pins to match the footprint of the SparkFun FTDI Basic Breakout. This board is provided as a kit, the headers are not attached, and soldering is required to assemble. Simply solder the two socket headers on the side of the board. Place a bluz DK into the sockets as you solder them to keep them aligned. Solder breakaway header onto the socket for the FTDI board. The UART shield can be used for serial debugging, or to upload firmware through the bootloader as described in the tutorial.